UV Skinz will be exhibiting at the American Camp Association's Tri-State CAMP Conference 2015 at the Atlantic City Convention Center in Atlantic City, New Jersey from March 16-19, 2015. Our products only require one application for all day protection and carry a UPF rating of 50+, which blocks over 98% of the sun’s harmful UVA and UVB rays. UV Skinz, a leading provider of sun protective clothing, is proud to announce its exhibitor participation at the American Camp Association's Tri-State CAMP Conference in Atlantic City, New Jersey from March 16-19, 2015. UV Skinz encourages attendees of the ACA Tri-State CAMP Conference to stop by booth #233 to pick up their free gift, and to learn about UV Skinz’ vast array of UPF 50+ protective sun wear options for campers. UV Skinz attendance at the 2015 ACA Tri-State CAMP Conference marks their second appearance and another step forward in the company’s mission to protect children from the damaging effects of the sun’s UV radiation. While having fun is a top priority at most of these camps, UV Skinz wants to make sun safety an equal priority. “Most people don’t realize that one severe sunburn as a child more than doubles the risk of getting skin cancer as an adult,” explains Rhonda Sparks, Chief Executive Officer and Founder of UV Skinz. Rhonda adds, “We want to raise awareness about the need for effective sun protection and the ease of sun protective clothing. Our products only require one application for all day protection and carry a UPF rating of 50+, which blocks over 98% of the sun’s harmful UVA and UVB rays, while most sunscreens require multiple applications for the same period of protection and do not always block UVB rays.” UV Skinz is committed to educating campers and camp staff about good sun protection habits, and hope to provide them with the ultimate in sun protection apparel, both of which are essential to their safety. More than 3.5 million cases of skin cancer will be diagnosed in the United States this year, and current estimates state that 1 in 5 Americans will develop skin cancer in their lifetime. UV Skinz hopes to change these statistics, as nearly 90% of skin cancers are preventable. “By attending the 2015 Tri-State CAMP Convention, we hope to meet new partners who will help us spread the word about sun safety and the need for quality sun protection,” states Rhonda Sparks. 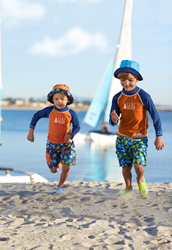 UV Skinz is a leading provider of UV protective sunwear, swim shirts and accessories for the entire family (sizes 3mo – 4XL). By providing the highest quality and fashionable designs at competitive prices, UV Skinz aims to make sun protection easy and effortless for the user. For more information about UV Skinz products, visit http://www.uvskinz.com. For information about interviews, samples and/or jpg photos, please contact Kristen Marion at KBarrett(AT)pitchpublicrelations.com.